Given this background, it is wonderful to see Imminent Disaster and Blanco returning and I hope that the threat of "the brown burner" has finally subsided. 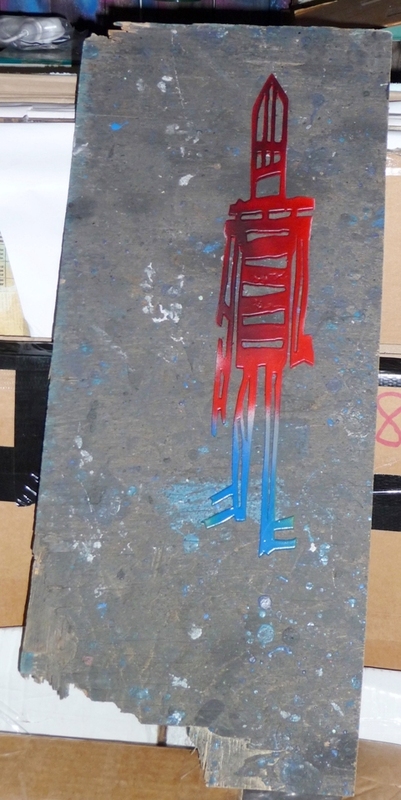 I love how the paper cut over the old cheekz piece reveals the paint of that hateful individual. Follow this link to partake in the discussion about street art’s photo documentation following. How’s this blog post for voyuerism ? Imminent Disaster‘s intricate paper cut designs are beautiful enough in the gallery, but when she puts them on the street, you can’t help but be amazed. I don’t even want to think about how much time one of those takes her to make. If you could punch one living contemporary artist, who would it be? There are better people to hate on the planet than other people that make things. Street artists often profess this war of conscience around the gallery/street issue, but you don’t seem to share those conflicts. Institutions provide other opportunities. If there’s this populous notion of ‘I want to show my work to as many people as possible’—you’re going to get that done a lot better institutionally. You may get a lot of passerby on the street, but think about how many people move through The Met each day. Along the notion of “reclaiming public space,” why is street art is concentrated in “hipster” or gentrifying neighborhoods? It’s a valid observation, and comes up often in the street art scene. 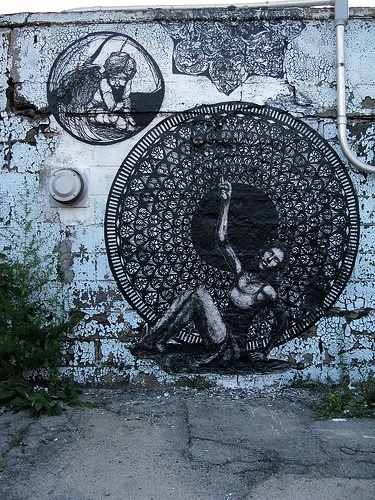 It probably has to do with the fact that street art is a scene with a different audience. There are obscure graffiti spots in abandoned buildings or tunnels that are more about the difficulty of getting to the spot and therefore, will likely only be seen by other writers. Whereas street art tends to prefer to be seen by the scene—people who watch, collect, curate but do not necessarily do street art. The duration of the mediums also might factor in on this. 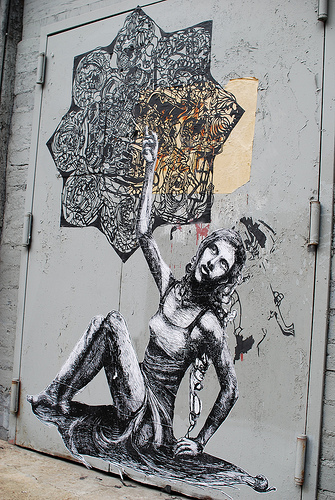 If wheatpaste was a more permanent mark on a wall, street artists might be more exploratory with their placement and find more obscure spots that would get much less traffic but last much longer. 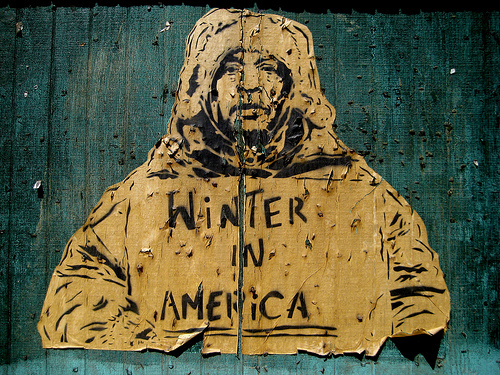 A look to stencil artists might prove this theory wrong, however. Even though it would last forever, I’ve never seen a celebrity head stencil in Queens. I know I’ve personally been very lax on interviews on Vandalog for a long time, but I’ve got 2-3 coming up soon so keep an eye out for that. 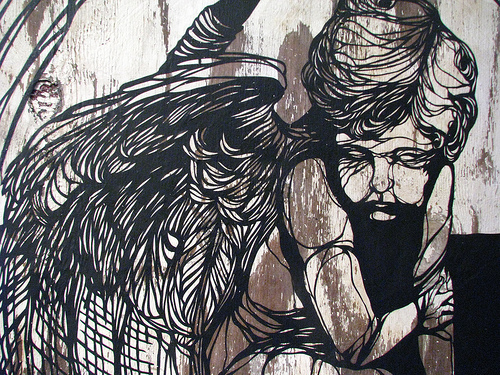 What do you get when you put Swoon, Gaia, Dalek, Shepard Fairey, Imminent Disaster, Oliver Vernon, PISA73 and EVOL all in one show? I’m not sure, but it sounds like a recipe for awesome. And that’s just what Irvine Contemporary are doing in DC next month. 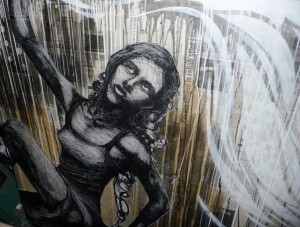 And remember, Swoon is involved, so it’s not going to be your plain old group show. 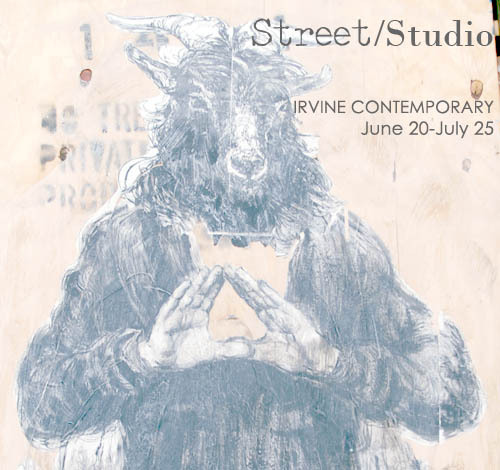 The show, called Street/Studio, is going to have a gallery component and an outdoor bit as well where the artists cover the alleyways near Irvine Contemporary. Can’t wait to see photos from this show. The only artists I’m doubtful about are Oliver Vernon and PISA73, but hopefully they make it work. And don’t miss the panel discussion at American University on June 19th with the artists and the curator of Shepard Fairey’s show at the Boston ICA. Hopefully there will be video for those of us who can’t be there. Sounds like a New York City condo development has been using Imminent Disaster’s work without permission. Luckily, after multiple emails, they’ve taken the image off their website. Check out her flickr for the full story. New York street artist Imminent Disaster recently did an interview with Commandax, and I have to say it’s 10x more detailed and better than 99% of interviews with street artists. Anybody who likes Imminent Disaster should read it, and if you don’t know who she is, you’ll probably like her by the end of the interview. My favorite little factoid from the interview: Imminent Disaster once played Janet in The Rocky Horror Show. Some great teaser shots of the first big show of ’09 over at Arrested Motion. 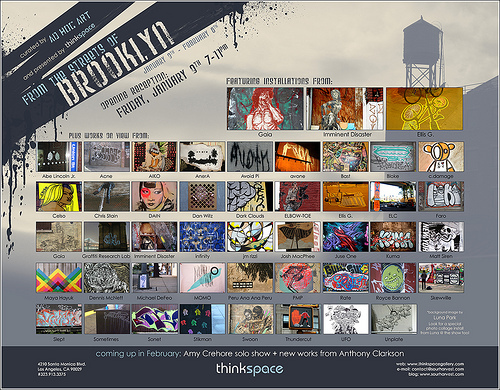 “From the Street of Brooklyn” opens January 9th at LA’s Thinkspace gallery. 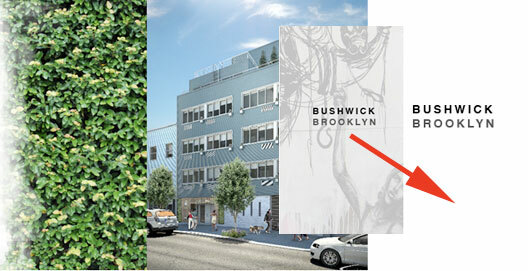 The show is curated by Brooklyn’s Ad Hoc Art. Vandalog’s Q&A with Ad Hoc Art’s Director, Andrew Michael Ford, can be found here. They’ve gotten some of New York’s best and most prolific street and graffiti artists together for one large group show. Looking at the artist lineup, it seems like the only way this show could bring Brooklyn to LA any better would be to transplant a street. 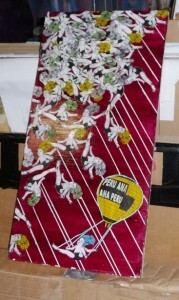 As part of Vandalog’s “Great in ’08” series, which will be running every day for the rest of the month. Check out previous posts here. Street artists from across the world have been offered one post to “gift” to one artist that they feel has been doing great work recently. Today it’s Imminent Disaster‘s turn. Who is one artist doing really great work right now? Imminent Disaster: Chris Stain because he is one of few doing overtly political work on the street, and his images are earnest and beautiful, humble and humbling.